Who Will Claim Responsibility for the Recent Bangkok Bombing? Responsibility, where it has been claimed, has at times lagged actual terrorist attacks. Claiming responsibility was never a strong point with al-Qaeda, Jemaah Islamiyah (JI) and the assortment of Islamic salafists who have deployed a range of terrorist tactics in pursuit of their political and religious agendas over the past two decades. Osama bin Laden took three years before claiming direct responsibility for the September 11, 2001, attacks on the United States. In the aftermath of the 2002 Bali bombings, initial suspicion fell on Indonesian police and military officials. Many of the JI suspects responsible for the blast were rounded up before any of them could or would claim responsibility. It took a month before a tape was released attributed to bin Laden claiming the attack was in response to Australia’s role in winning East Timor independence from Indonesia and its support for the U.S. invasion of Afghanistan. Still the guessing game surrounding these types of terrorist strikes are understandably part and parcel of the all-too common angst-ridden routine accompanying each deadly blast. 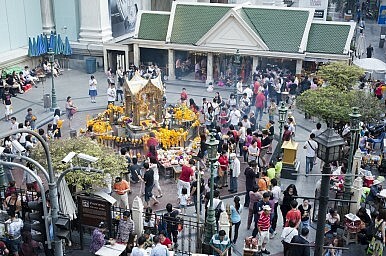 In Bangkok, blame over the bombing of the Erawan shrine – popular among Chinese – that left 20 dead has been no different. There’s no shortage of suspects amid an amateurish investigation by irritated authorities who seem miffed that no one has stood up and claimed responsibility. Why would anyone do that anyway? The influence of Islamic State (IS), its ability to attract militants from this part of the world willing to wage war in the Middle East, and the danger they pose upon their return cannot be underestimated. That makes such militants a prime suspect in Bangkok. Like JI, their political and religious agenda includes an Islamic caliphate across Southeast Asia, extending even as far as northern Australia. JI, a spent force these days, along with al-Qaeda, had an unwanted habit of trying to hijack regional insurgents who were battling central governments for a range of political and territorial reasons, from Poso and Aceh in Indonesia to Mindanao in The Philippines and Yala in Thailand’s south. An IS attempt at hijacking the troubles in southern Thailand cannot be ruled out of the Erawan equation. But any suggestion that southern rebels were behind the August 17 blast, which left another 126 people wounded, have been roundly rejected by observers. Importantly, the pipe bomb detonated at the Erawan shrine was not the typical homemade fare found among regional insurgents. It was built on an industrial scale, packed with TNT and ball bearings, and deployed with a military-style precision. Chinese tourists were among the victims. They are also prominent around the Saphan Taksin bridge where a second bomb exploded within 24 hours of the first. If they were deliberately targeted, then suspicions must take into account the Grey Wolves, a violent pan-Turkic group, and the atrocious handling of ethnic Uyghurs who have a habit of fleeing China for Thailand where the great hope is safe passage to their ethnic homeland, Turkey. On July 9, 109 Uyghurs were repatriated to China — manacled, hooded and expelled amid fears voiced by the United States and human rights groups that lengthy prison terms and possible torture awaited them. Their wives and children were separated and allowed to leave for Turkey. The United Nations said Thailand had violated international humanitarian law. Their treatment also roused the right-wing Grey Wolves, who retaliated and trashed the Thai embassy in Istanbul in support of the Uyghurs, who hail from China’s western Xinjiang province (which they call “East Turkestan”). There is no evidence linking the Grey Wolves to the bombing. Even if they were responsible there is nothing to suggest they will please Thai military authorities by coming forward to claim responsibility. But that should not stop Thailand, China, or the outside world from taking the Grey Wolves into account along with the very sorry behavior meted out by Thai and Chinese officials in regards to a highly marginalized Uyghur population.